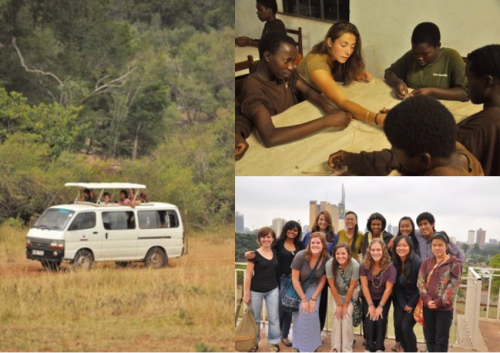 Eneka Lamb participated in DukeEngage-Kenya-WISER in 2011 as a way to experience what she learned in the classroom at work in an actual community. Her passion for global health has taken her around the world, from conducting medical education research at Duke-NUS in Singapore to working at remote hospital in Guyana with the Peace Corps. Eneka is now in Washington, DC, where she is pursuing a graduate certificate in advanced biomedical sciences. Why did you choose your DukeEngage program/independent project? DukeEngage was one of the reasons I fell in love with Duke because it challenges students to venture outside their boundaries, employ what they’ve learned while being eager to absorb more, and ultimately partner with others to change the world for the better. It may sound idealistic, but I believe in this mission, curiosity driven academic exploration and the critical importance of being a global citizen. While participating in the Vulnerable Populations concentration of the Global Health Focus program, I felt compelled to experience how health and vulnerability intersected in a real community, and particularly interested in the solutions that could be generated by partnering with community members. Dr. Broverman was a professor and mentor of mine who suggested I apply to the Kenya–WISER program and we discussed the possibility of conducting an independent project related to health in the Muhuru Bay community surrounding the WISER school. Two other students were interested in the project and with Dr. Broverman’s support, the three of us planned to conduct a needs assessment in local health facilities around Nyanza Province and go from there. By the end of the summer, we completed an evaluation of the health clinics in Nyanza Province identifying barriers faced when getting children fully immunized. The needs assessment revealed approximately 95% of children in the province received their first immunization, but this number dropped dramatically to 7% of children who were fully immunized at 5 years old. A concerning trend, we wondered what cultural, logistical, financial and other barriers contributed. The project involved informally gathering information about the community’s perceptions of childhood immunizations; developing, translating and testing a consent form and survey for mothers with children ages 5 and younger; conducting a 2-stage cluster survey with 45 mothers in various areas of the province (assisted by the translator); analyzing the collected data and presenting our findings and recommendations to Kenyan provincial health officials. Eneka Lamb and fellow DukeEngage participants work with students and community members in Muhuru Bay, Kenya. Photo credits: Frank Lee and Elizabeth Tijerina. I am presently in the George Squared Advanced Biomedical Sciences program at Georgetown and George Mason Universities. 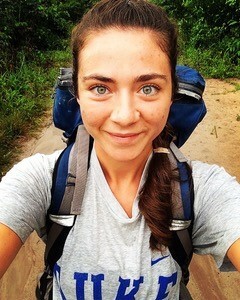 In July, I completed 39 months as a Peace Corps Volunteer in a rural indigenous village in the rainforest of northwest Guyana, bordering Venezuela. Focusing on maternal and child health, I worked at a remote district hospital serving a community of approximately 16,000. Prior to my Peace Corps service, I worked at Duke-NUS Graduate Medical School in Singapore, where I conducted medical education research, and created an open source website hosting hundreds of videos about various medical topics for students who are preparing to take the USMLE. Did DukeEngage influence your academic or career path? If so, how? I believe DukeEngage certainly contributed to my academic and career paths by encouraging me to pursue a Program II major, learn about the United States Peace Corps and ultimately serve as a Volunteer, and most importantly adopt a holistic, somewhat cultural anthropologic approach to health and medicine. What was the most meaningful part of your DukeEngage experience (personally, academically, or professionally)? To survey mothers, I walked with our translator from one house to another, around the province; sometimes we walked for hours between houses. In this time, we talked a lot and I was struck by how similar we were and how easily we could relate, despite growing up on different continents and leading very different lives until our paths crossed that summer. Moreover, when meeting the mothers we interviewed, even though many of them didn’t speak English, and I only picked up a handful of phrases in Dholuo, we bonded; communicating through smiles, eye messages, hugs, tears, holding children and eating, I suppose. As women in the community told me their stories, they invited me to share in their experiences of pain, excitement, joy, sorrow, etc. ; this was profound. Do you have a specific lesson learned from your DukeEngage experience that still holds true today? If so, what was it? Listen to absorb, not respond. Do you think DukeEngage is an important program? Why or why not? Without a doubt. Hopefully, most students, faculty and the communities involved in DukeEngage programs have positive experiences that expand the definitions of possibility, health (as in my case), and/or other concepts, and facilitate connections that transform. What’s one thing you want people to know about DukeEngage—in general or about your particular experience? There are domestic DukeEngage programs as well!